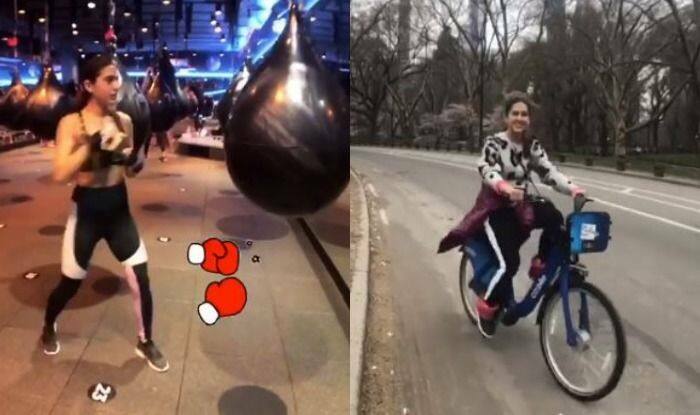 Sara Ali Khan explores New York City on a bike and also tries a hand at boxing. Sara Ali Khan is in New York City exploring it with her friends and is totally loving it. After giving two hits films, Kedarnath which was her debut film and Simmba, the young actor decided to pamper herself by getting tickets to New York. Recently, Sara shared videos of all the activities she has been doing in the city which includes, reading, riding a bike on the streets and trying her hand in boxing. Sara Ali Khan has been keeping her fans updated with everything she is doing in The Big Apple. While earlier she gave a little tour of the place, earlier today, she gave a glimpse of the activities she is trying around. She recently took to her Instagram stories to share a few boomerangs. In one, she is seen with a ‘Mean Girls’ book in her hand, while in another, she is riding a bike on the streets and in the last one, she explores the field of boxing. Earlier, she shared few pictures strolling through the streets of New York alone and few of having a gala time with her friends.